I think most people have noticed oil price increasing significantly over the last 12 months. I started to expand on this topic in my latest post about Dream International. I realized going through all those years of annual reports that the price of oil had a impact of the raw material cost for all the teddy-bears made. In the past years the collapse of oil has boosted profits for a large number of companies, on the raw material and energy side. But the part that probably is not discussed enough is the transportation cost and especially in countries where oil is not heavily taxed. A friend of mine recently did an analysis of companies exposed to the increasing transportation costs in the US. After a longer discussion with my friend I was a bit baffled that I haven’t been able to see this more clearly myself. The labor costs increase and extreme labor shortage among truck-drivers in the US has been well covered. The second part of the equation is of course also the increasing oil price. But how this together changes the picture in terms of transportation, is something I at least have not reflected enough upon. In many cases its hard for companies to fully transfer the increased transportation cost to the end buyer, especially in the short term. 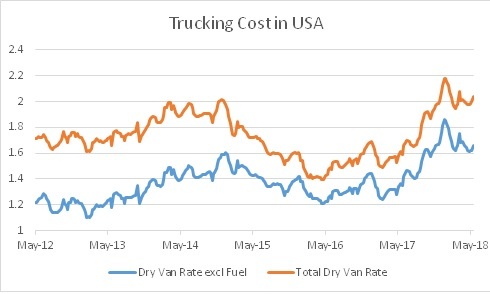 There is also a forward market for both trucking rates and oil, which means that competitors might have hedged their costs further out. More importantly different companies most likely have hedged it differently, or not at all. So the company which has no or shorter tenor of its hedging will face increasing cost, with little to no possibility to transfer that cost on-wards. All this brings me back to my analysis I recently made on Huhtamäki. In my recent analysis of Huhtamäki. I understood that valuation wise we needed to see a margin improvement. It seems feasible to believe that such improvement is possible, looking at competitors margin levels. But maybe its the other way around, everyone’s margins are actually coming down? Part of Huhtamäki’s products are flexibles, plastic based products, meaning dependent on price of oil. The other part is high volume paper based products like paper cups etc. A products which most likely is highly sensible to increased transportation costs. How Huhtamäki in the current environment with US being its largest market, could raise margins, is going to require some pretty magical management execution. So after contemplating this a bit more, I need to revise the probabilities for my bear/base/bull cases. The conclusion then is that this is a clear sell, in the short to medium term. Therefore as of today I sell my full holding in Huhtamäki. As noted in the linked articles a lot of companies are affected by this. In my own portfolio I see several companies that could see headwinds due to this: Dairy Farm (Asian retail), Olvi (Selling beer in northern Europe), Inditex (Clothes retailer, shipping much of its clothes by air), Essity (selling paper based products worldwide). Essity probably being the next company I need to take a closer look at, for example competitor Kimberly Clark has been in a downtrend for a year now. We have recently seen US retail giants like Kraft Heinz drop tremendously, there are many reasons for that drop, but partly it could also be related to transportation costs. One should not change the whole portfolio, just because oil price has increased, but it might affect share performance in the short/medium term significantly for many companies.